Heat oven to 350°. Grease bottom and sides of rectangular baking dish, 13x9x2 inches, with shortening. Spray 10-inch skillet with cooking spray; heat over medium-high heat. Cook bell pepper and onion in skillet, stirring occasionally, until tender; remove from heat. Stir together Bisquick, milk, mayonnaise and eggs. Pour half of the batter into baking dish. 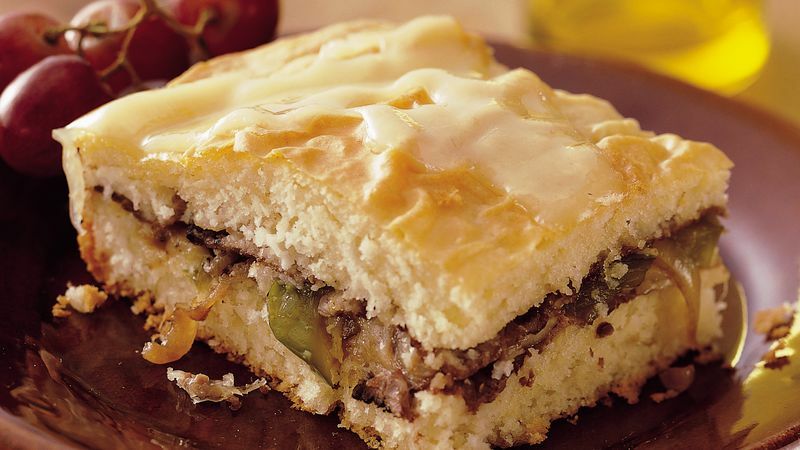 Top with half of the beef, the bell pepper mixture and three-fourths of the cheese. Top with remaining beef. Pour remaining batter over beef. Bake uncovered 35 to 45 minutes or until golden brown. Top with remaining cheese. Let stand 5 minutes before cutting. A large glass of milk and a cluster of grapes are all you need to complete a quick and easy lunch. Purchased cut-up fresh fruit from the deli would also be a simple way to complete the meal. This sandwich is an easy version of the original Philadelphia Cheese Steak, named for the city that is thought to have created the sandwich in the 1930s. It consisted of an Italian or French roll topped with thinly sliced beef and cheese (usually American) and sometimes sautéed onions.